OrangeA Vertical Climber and Stepper, 440lb. 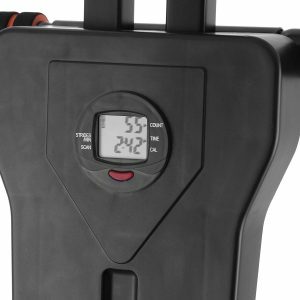 This is a modern hot new release vertical climber and stepper for a great complete body workout by OrangeA, with a simplistic design and a 440 lb. (200kg) weight capacity thanks to its sturdy steel frame. It offers a decent low-impact type anaerobic and aerobic workout in the comfort of your home. And you can easily burn calories and fat if you’re intending to lose weight or tone your muscles in your upper and lower body as well as the abdominal section. You will be targeting buttocks, abs, legs, triceps, biceps, shoulders and more. OrangeA Climber weighs 30 pounds with a decent 440 pounds user weight capacity and measures 38 x 28 x 72 inches, has a folding design so you can simply put it in a corner or under your bed. It looks nice in black and even includes a solid plastic LCD panel and the rest of the unit is mainly steel, except for the foam handles and rubber feet. The LCD display shows the calories burned, time exercised, count and scan that moves between these indicators one by one so you can keep track of time and reps easily. You’ll get a low-impact workout that will not really be that much of a burden on your knees or joints. But this can be classified as a very intense interval training, where you can really have a high-intensity workout in a shorter period of time and take more time to recover your muscles. It basically imitates the realistic movements of mountain climbing by which you burn lots more calories while strengthening your muscles. You will be using your own body weight and the results you get will depend on how hard you push it. If you go slower and lighter then you will be working on your lower body only and for a total body workout, you need to push it harder. The number of calories you’ll burn will depend on your body weight and how hard you exercise but on average you will be burning 500 calories in an hour on the vertical climber. The difference is you will feel a lot safer than when you’re climbing the mountains. It is simple to assemble, is built quite solid and sturdy and offers rather quiet and smooth movements. The anti-slip rubber feet will ensure the unit stays stable even during the hardest workouts. It is nice to have an LCD panel that is not found in some other similar vertical steppers but doesn’t have the extra bells and whistles of the much more expensive models. In the package, you will find the vertical climber, a user guide, and a toolkit.